SPECIAL OFFER! RRP: £325 (+VAT). SAVE £32.50! The Skipper Plus moisture meter detects moisture in wood or GRP (Glass Reinforced Plastic) by measuring the resistance between two low frequency AC signals transmitted from the soft rubber electrodes on the base of the instrument. 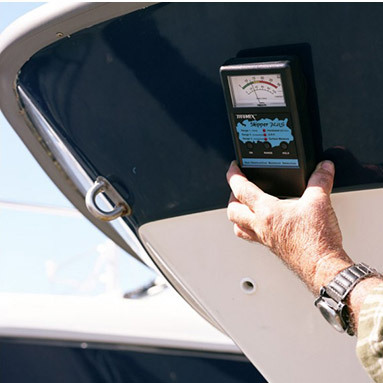 Because salt water is more conductive than fresh water, the Skipper is fitted with different ranges of sensitivity to allow testing of wood or GRP in either fresh or salt water environments. Dimensions: 150 x 80 x 30 mm (6 x 3.2 x 1.2 inches). Weight: 260 grams (9 ounces) including battery. Battery: 9 volts PP3 or equivalent.